The Vampire Facelift® is a minimally invasive and painless treatment that brings together PRP and dermal fillers to give you a younger and radiant look. Dr. Sherry & Anew You Med Spa are proud certified providers of the Vampire Facelift®. This revolutionary facelift is a treatment that combines the science of PRP and dermal filler to give you amazing natural-looking results. The PRP used will be derived from a small sample of your blood to help produce and stimulate new collagen while the dermal fillers work to lift and fill volume loss due to aging. Dr. Sherry is a lover and expert of dermal fillers, Juvederm XC & Juvederm Voluma XC, and she's no stranger to PRP treatments. At this stage you are seeing little to no signs of aging, in which the Vampire Facelift can have preventative benefits and help maintain the lift & youth in your skin. The Vampire Facelift has also been used to treat teenage acne and acne scarring. You are at the stage to where you are experiencing visible signs of aging, from wrinkles to volume loss, in which you can greatly benefit from the Vampire Facelift. The PRP part of the Facelift can help replenish and stimulate collagen while the dermal fillers can reserve the volume loss. Our patients in this age group experience volume loss due to aging. The Vampire Facelift is able to conquer more problems than other treatments and generally requires fewer treatments needed. Dr. Sherry carefully evaluates your concerns and discusses the best way to address them. Thinking you want to contour your body too? Learn about CoolSculpting here! After a consultation with Dr. Sherry, she will walk you through the entire process and answer any questions or concerns. It involves two separate parts, which make it different than the Vampire Facial! Using two treatments in one also makes it a one-stop shop that our previous clients have loved! The first part is the dermal filler, in which, Dr. Sherry will use Juvederm XC & Juvederm Voluma XC to restore natural-looking lift and volume to the face. Each client has different needs and desires and Dr. Sherry treats the areas that are a concern for you, specially during this first part of the Vampire Facelift. Secondly, Dr. Sherry will take a small blood sample, to derive plasma rich platelets (PRP). She then strategically implants the PRP into the areas which will give you your desired results. 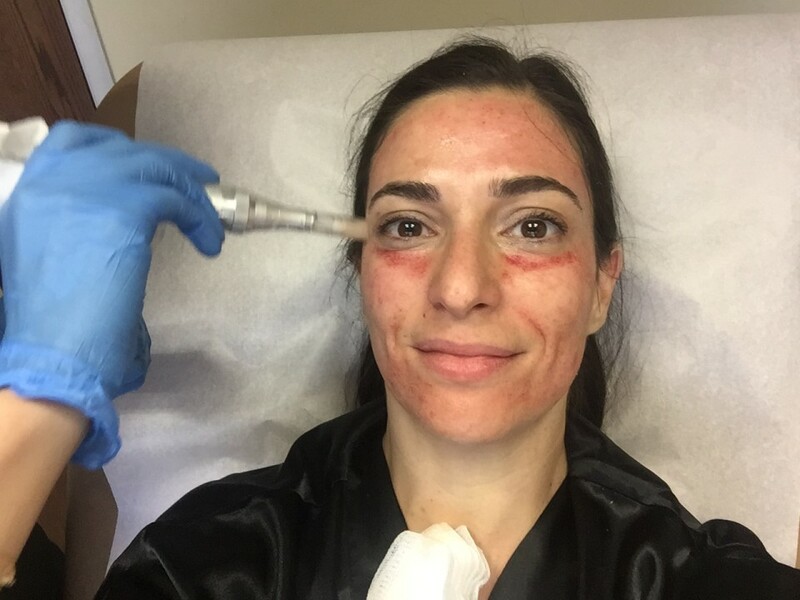 This is the part of the Vampire Facial that will stimulate new collagen, new fatty tissue to help the smooth your skin and improved blood circulation that helps with your tone and texture. This is the part that is all natural & produces results over time, naturally. The Vampire Facelift's results come in multiple waves after the duration of your treatment. We've broken it down to give you approximate peak results, but every person is different and may see improved results at different times. Dr. Sherry and the Anew You team also suggest to maintain your skin with a filler and skin care regimen. You will see that you have volume and notice the lift in your face and neck. You will also start seeing the beginning of your new youthful glow due to the PRP stimulating new collagen. This is the time that you can really start noticing the PRP taking place with improved skin texture, color, and tone. This is due to the improved blood circulation and collagen production. During the rest of your first year after the Vampire Facelift, you will see more improvement concerning the skin's tone, texture and tightness. Since the PRP part of the Facelift is natural this is the period at which the results peak. Why choose anew you in San Antonio for the vampire facelift? Celebrities turning to Vampire Treatments to restore youthful look!